We’ve seen a lot of standing desks, including those made from IKEA parts, but artist/designer Kelli Anderson managed to make one of the nicest convertible options yet. With IKEA storage furniture, Google Sketchup, and help from some friends, she was able to make this simple and stunning workspace with plenty of room for everything—regardless of how she wanted to work. The desk started with the IKEA AKURUM cabinets stacked next to each other with one open space for a desk. Kelli then added a linear actuator, which lifts the desk up into standing position with a push of a button, so it could change heights based on how she wanted to work. As you can see above, the result is quite nice. You need a lot of space to fit a desk of that size, but could build a smaller version if you wanted as IKEA’s AKURUM series comes in many varieties. To learn about the entire process and how you could build one of these yourself, check out the full post (complete with many photos and some video) on Kelli’s blog. This year certainly had its share of ups and downs in terms of lawyerly antics, but in our minds, 2013 shall forever be known as the year of the snarky cease and desist response letter. Back in June, we broke the news of the now famous response to a cease and desist letter received from the Town of West Orange, New Jersey, which went viral worldwide thanks to the power of sarcasm. A few months later, we wrote about an equally entertaining response to a cease and desist letter received from the American Bankers Association, rife with Spice Girls lyrics and Valley girl lingo. It’s been a while since we wrote about one of these treasures, so we figured we’d close the year out with a bang. We discovered yet another amazing response to a cease and desist letter, and this one may be the greatest of them all — if only because we think its author might have been drunk while writing it…. 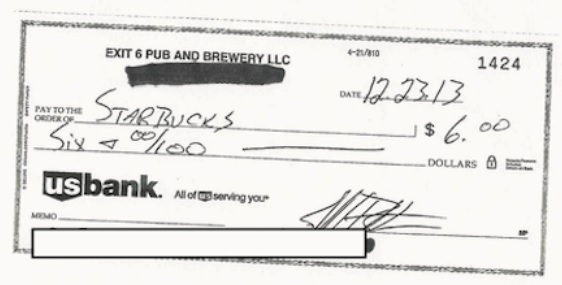 Jeff Britton, the owner of Exit 6 Pub and Brewery in Cotteville, Missouri, received a cease and desist letter from none other than Starbucks, specifically from Anessa Owen Kramer of Honigman Miller Schwartz and Cohn, over a beer named “Frappicino.” As the world knows, the lords of coffee sell a frozen drink (a coffee Slurpee?) by the name of “Frappuccino.” Yes, the names are similar, but to be confused enough to think you could order the nectar of mall-hopping teenage girls at a bar, you’d have to be pretty drunk. So quick little story. Last week I received a cease and desist letter from the attorneys at Starbucks. Apparently there was a beer on Untappd that someone named “Frappicino”. 3 people had checked into said beer. 3. Starbucks [didn’t] like that. So I got a letter. They wanted me to remove the beer and promise never to use their names again. They also wanted my written response and guarantee. Here is their letter. And also my response. Exit 6 has proudly sold at least 38 drinks in Cottleville MO and has a strong presence in St Charles county, a suburb 40 miles outside the St Louis metropolis. It has recently come to Exit 6 Pub and Brewerys attention that there were 3 check ins to the beer with a very similar name to the “F Word”. Unfortunately it was only similar to the F Word because we meant to call it the same thing. Lucky for us, we’re poor spelers. I would like for both Ms Owen Kramer and Mr Bucks to rest assured we meant no deception, confusion, or mistaking in the naming of the beer F Word. We never thought that our beer drinking customers would have thought that the alcoholic beverage coming out of the tap would have actually been coffee from one of the many, many, many stores located a few blocks away. I guess that with there being a Starbucks on every corner of every block in every city that some people may think they could get a Starbucks at a local bar. So that was our mistake. Mr. Bucks isn’t Ms. Owen Kramer’s co-counsel; no, this “poor speler” is addressing Mr. Star Bucks himself, as if he were an actual human being. We imagine Britton was at least six Frapps in at this point. Behold: the legal equivalent of a mic drop. Cheers to you, Jeff Britton! We raise a glass in your honor. 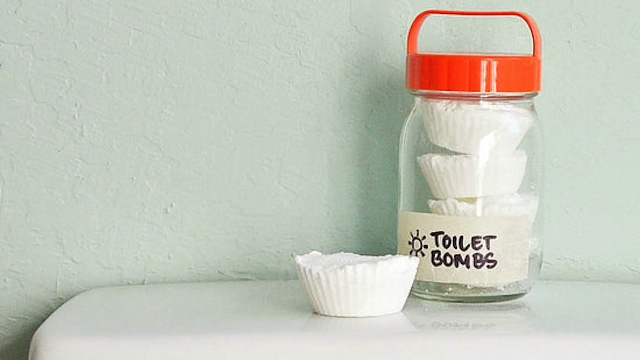 We’ve talked about the best ways to unclog a drain before, but these handy toilet-clearing tablets are helpful to have on-hand in case yours stops flushing the way it should. Plus, they’re really easy to make. Mix the baking soda and epsom salts together first, and try to mix them so you don’t get any clumps. Then add the dish soap one tablespoon at a time until the whole thing has the consistency of wet sand. Pop the liners (SavvySugar suggests silicone liners, since the tablets will be easier to remove) into your muffin tin, then fill each liner and pack it down tightly. You’ll need to let the whole thing rest and dry out overnight—preferably a little longer just so each tablet is completely dry and comes out of the liner easily. Then, when it comes time to use one, grab a tablet, drop it into the toilet, cover with a few cups of hot water, and let the tablet dissolve for a few hours (or overnight, if you can wait that long). Then try flushing the toilet again. That’s all there is to it. It works like a charm, and there are no harsh, pipe-damaging chemicals involved. Hit the link below for more photos and the full walkthrough. One of the most successful authors in the world, Walter Isaacson, is seeking the wisdom of the crowds for his new book about the technology industry’s major inventors. In an interview with TechCrunch, he explains why he decided to open up his writing process to the world. The third part of YouTuber Mike Habjan’s computer animated slugfest between the Hulk and Christopher Reeve’s Superman. Mike’s CG skills are steadily improving. Be sure to watch it in 1080p.